In our book Lost Duluth, the most recently constructed building featured is Roy and Edythe Halvorson’s remarkable Modernist home designed by Harold St. Clair Starin, which stood at 2628 Branch Street from 1939 until 1994. Since the book’s publication, several readers have explained to us that the house that stood at that address prior to the Halvorson home should just as well have been included in the book. We also received a reader inquiry last summer about an old stone wall East of 26th Ave. E. on Jefferson Street. It turns out the wall marked the southern border of the estate the house sat on. 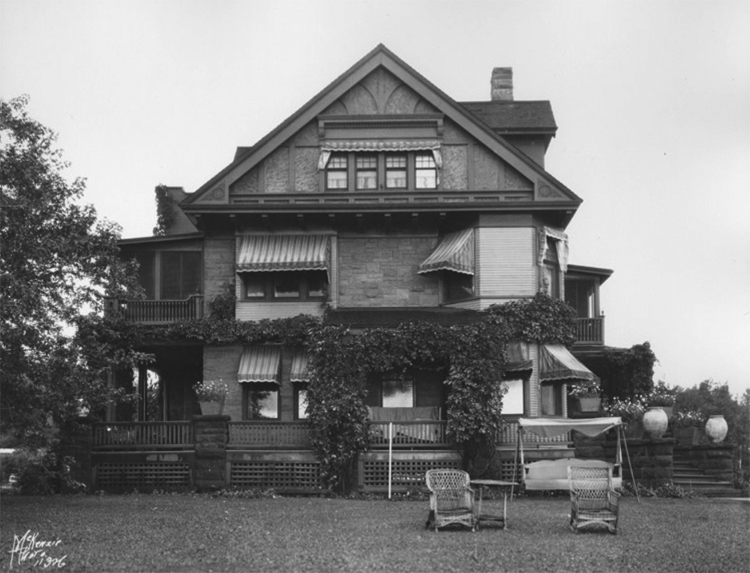 So, with the help of some interested readers, this month’s lost landmark is the Thomas D. and Elizabeth Merrill House. Born in 1855, Thomas D. Merrill was the son of a Michigan lumberman who, like many lumber barons, had holdings that stretched from Michigan to Washington State. In 1880 his family traveled to Seattle along with another lumber family, the Rings. In 1886 he and Clark Ring purchases the elder Merrill’s logging and milling operations in Michigan, Minnesota, Washington, and Canada. They called the new firm Merrill and Ring. After their Michigan holdings were exhausted, Merrill and Ring began constructing a “massive” sawmill on West Duluth’s Grassy Point in 1891. Capable of producing 25,000 board feet of lumber a day, the mill was operational the next year and by 1894 had had its capacity increased to 50,000 square feet a day. Like many other lumber firms, Merrill & Ring invested in more than just their sawmill. In 1899 the firm established the Split Rock Lumber Company and hired lumberjacks to harvest an estimated 200 million board feet of timber on land it had recently purchased. It then built a logging railroad to bring the logs to the mill on St. Louis Bay. The mill operated until 1906 and was dismantled the following year. When Merrill and Ring’s mill began operation in Duluth in 1892, Thomas Merrill moved from Saginaw to the Zenith City with his new bride, the former Elizabeth Musgrave Crosswell. Both had lost a spouse. Elizabeth was the widow of former Michigan Governor Charles Croswell, 25 years her senior, whom she had married in 1880. Croswell died six years later, three months before the birth of their daughter Sallie. The newlyweds built a home along 26th Avenue East between Branch Street and Greysolon Road as early as 1894, when city directories first listed the Merrill house at 2626 Branch Street. The address was later changed to 2625 Greysolon Road. City records have no building or demolition permits for the property from that time, and the design does not resemble anything Duluth architects were creating in the early 1890s. So it may well be that one house was built in 1893 with its main entrance facing Branch Street and later (likely c. 1910) it was demolished to make room for a new house facing Greysolon, explaining the change in address. It is also possible that the 1893 house was enlarged and renovated so that its main entrance faced Greysolon. Photos of the Merrill home taken in 1926 show an eclectic home featuring elements from a variety of architectural styles—more similar to the homes built east of Twenty-First Ave. E. after 1900, not the Victorian style popular in the 1880s and ’90s. The house stood three stories high and was faced with red brownstone quarried along the Wisconsin South Shore of Lake Superior. Its diverse style includes hints of Queen Anne in the windows; Romanesque Revival in its stone wall cladding, chimneys, and one-story round tower; and even a touch of Tudor Revival half-timbering on the third floor façade. The front of the house was dominated by a square, three-story tower positioned at the center. It featured six roof dormers, two in front and four in back, also suggesting a construction period much later than 1893. The 1926 photos show a house partially covered in vines, so many other details are hidden. The Merrills likely remodeled the home and added decorative and functional elements throughout their ownership. The home included a ballroom and an elevator, said to be the first electric elevator in Duluth—but since we can’t verify the house’s construction date, we can’t be sure if it was indeed the first (Otis Elevators has been installing electric elevators in the U.S. since 1890). The walls of its opulent dining room were covered with brocaded silk and the entire house featured massive white pine beams. The lot upon which the house stood was also impressive. It stretched from Jefferson to Superior St. between 26th and 27th Ave. E. The home’s carriage house—now a private residence—still stands at 2620 E. Superior St. It’s design provides a clue to what the Merrill House must have looked like. Thom Halvorson, whose parents demolished the Merrill home to make room for their 1939 Modernist masterpiece, remembers finding a headstone for a beloved horse near the carriage house when he was younger. A tennis court once covered an area between the house and the carriage house, and the grounds also held a greenhouse. A stone wall that once marked the property line along the upper side of Jefferson Street still stands. While it has been neglected and is in disrepair, another wall in front of the carriage house along Superior St. show what the wall looked like when first constructed. After Merrill & Ring closed operations in Duluth in 1906, the Merrills spent more of their time in Seattle but still returned to the Zenith City to spend summers in their home on Greysolon Road. Mrs. Merrill died in 1928; local newspapers called her one of Duluth’s “most representative and outstanding women.” She worked with the Duluth chapter of the American Red Cross, the Duluth Woman’s Club, and the Duluth Art Society. She was a representative of the Duluth Women’s Council on the city planning commission. She and her husband traveled extensively, and while she was on the road she studied other cities and brought bring ideas back to see if they could be adapted to Duluth. Merrill himself lived until 1932. He was buried in a coffin made of cedar from Vancouver that he had hand selected and originally intended to use the wood to panel over the silk walls of the home’s dining room. At his request, the casket was lined with “blossoming branches of Gooseberry River Dogwood.” The house sat empty until the Halvorsons purchased it in 1938. While it was vacant it fell prey to curious neighbor kids, who played inside and caused some damage along the way, even cutting the cables of the elevator. Thanks to Thom Halvorson, Audrey Fischer, and David Claypool for their help to Roger Hartley, who graciously provided Zenith City with much of the information contained in this story.